I visited a different grocery story looking for ground turkey for my kofta’s and to my surprise I found Jamaican Ginger and Tumeric. I have never seen either of these in the store. Regular Asian ginger yes; but not its spicier cousin and the turmeric was a sign for my to go all in and try this ingredient I have had a love hate relationship with. Having a lifelong love affair with ginger, I thought it was an obvious choice to start trying to add turmeric into my diet alongside its “cousin” ginger. Now as easy as ginger is to enjoy for myself I just couldn’t get on board with turmeric. I have finally found a way to consume it and enjoy it along with all its benefits like aiding with ingestion and those all so important anti-inflammatory and anti-oxidant qualities keep calling me back. Well this soup struck a chord with me in the most delightful way and I can now enjoy turmeric and its unique scent and vibrant colour. 2. Prepare squash and place in a roasting pan. 3. 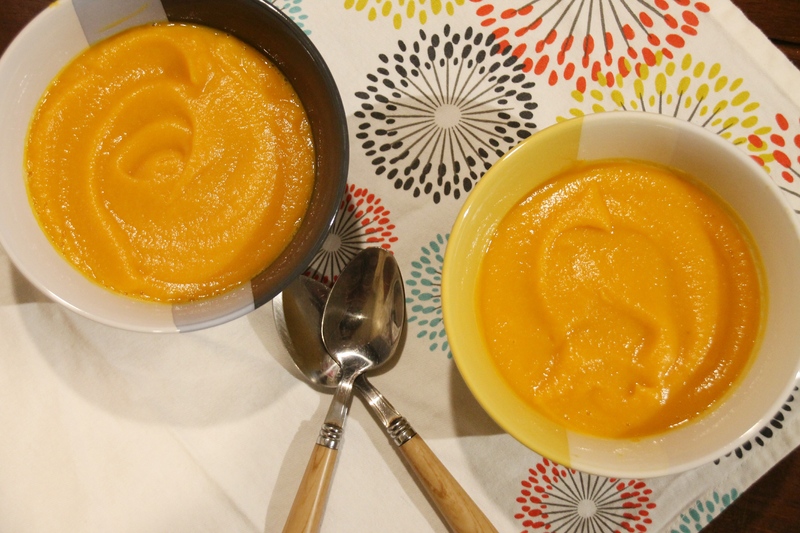 Boil sweet potato and carrot in a medium saucepan. 4. Once vegetables are done let cool for 30 minutes. 5. 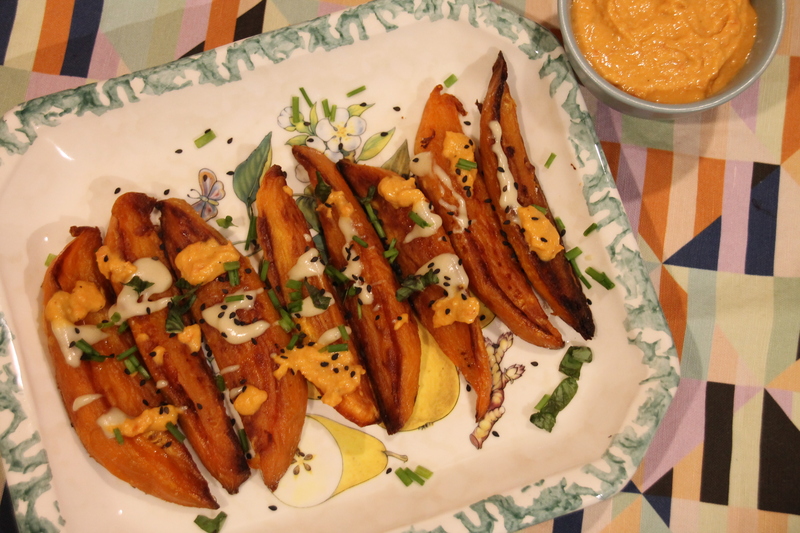 Peel away the squash skin and add to a blender along with the sweet potatoes and carrots. 6. Add turmeric and vegetable stock and blend. 7. Pour into two bowls and serve. •	Add more turmeric if you like. •	Use a Dutch oven if you prefer. I did start with a relatively small amount of turmeric in my eyes; but the soup surely had that lovely and distinctive turmeric scent. The colour of this soup is my most favourite of all the soups I have prepared. It also kept the colour upon reheating. I could taste each ingredients and they came together very well. This will be another soup in my rotation. If you want a faster dinner use your blender. I used the blender for Christmas for the purpose of using it solely for cooking and not my daily smoothie. I started off using the immersion blender in the Dutch over but I couldn’t’ get the consistency and the find turmeric to blend nicely and smooth. St. Patrick’s day is almost here and I have made a stacked cake for the occasion. 2. Trace out the pan using parchment paper and place in the bottom of three pans. 3. Spray pans with non-stick spray and set aside. 4. Using a stand mixer with the paddle attachment beat butter and sugar until fluffy. 5. Add in egg whites and vanilla and continue to beat until incorporated. 6. In a large sized bowl, whisk together flour, baking powder, baking soda and salt. 7. Pour into butter mixture alternating between milk and flour mixture three times. 8. Split the batter and add food colouring into two separate batches by hand and fold in. 9. Pour into three pans, smooth tops and slam pans on the counter top to release air bubble and ensure an even bake. 10. Bake for 30 to 45 minutes or until a cake tester inserted comes out clean. 11. Let cool in pans for 10 minutes and turn out onto cooling rack and remove parchment paper. 1. Place cream and butter in a small saucepan over medium heat and bring to a boil. 2. Remove from the heat and set aside. 3. Place sugar and water in a medium saucepan over high heat and cook, stirring with a metal spoon until combined. 4. Bring mixture to a boil and cook without stirring until temperature reaches 350°F using a candy thermometer and the mixture is a deep golden colour. 5. Remove from heat and working fast, add butter mixture in a thin steady stream, stirring to combine. 6. Return the pan to low heat and cook, stirring for 5 minutes or until caramel has thickened slightly. 7. Pour into a bowl and allow to cool at room temperature. 1. Using a stand mixer with the paddle attachment, beat butter until fluffy. 2. Add confectioner’s sugar and milk and combine until well incorporated. 1. Use a serrated knife, trim tops and even out if necessary to level out the cakes. 2. Crumb coat each cake and place in fridge and allow to firm up. 3. Frost each cake layer and smear a little frosting on the silver disc so cake doesn’t move. 4. Place first 8” vanilla layer on the bottom layer and spread some buttercream frosting over top. 5. Then place a 6” layer over and spread buttercream frosting over top. 6. Drizzle caramel over the edges of both cakes and allow to run down the sides. 7. 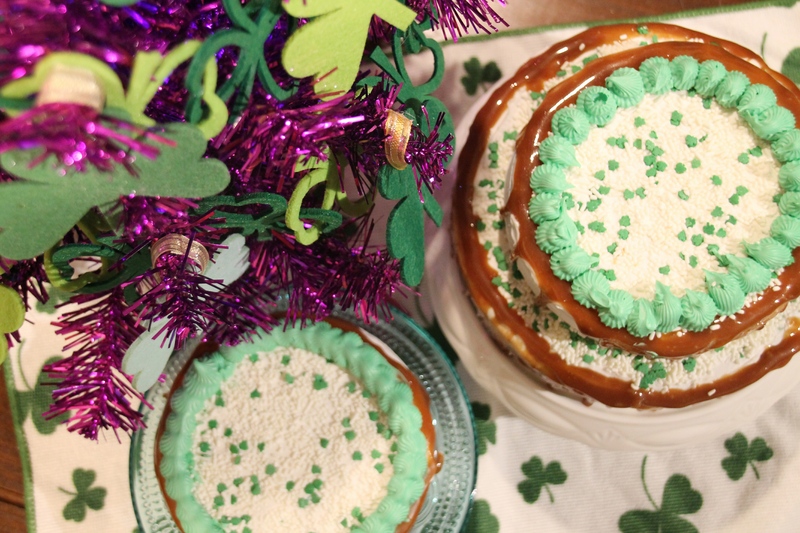 Stack one 6” cake on top of the centre of the 8” cake and sprinkle the shamrock sprinkles over the buttercream portion. 8. Then pipe along the edges beside the caramel. 9. For the second baby tasting cake drizzle caramel along the edges and the sprinkle shamrock sprinkles and pipe along the edges. •	Buy a container of egg whites, unless you are going to have a use for all these egg yolks. •	Use caramel from a jar if desired. I had leftover caramel from my tarte tartin so I used that. This was my first stacked cake and this was on my goals list. I was for the most part happy with how the cake turned out besides the application of the caramel. I found it hard to get the proper consistency and then the drizzle factor along with not melting the frosting. For a first attempt I was quite happy, so I’m not going to sweat it too much. Guests enjoyed it and were impressed that I made the cake; which was nice; but of course I saw all the flaws. It did however taste good and once the special guest of the day realized I had baked a cake, she told one of the servers to take away the rest so her and her husband could enjoy a proper slice at home. That totally flattered me. 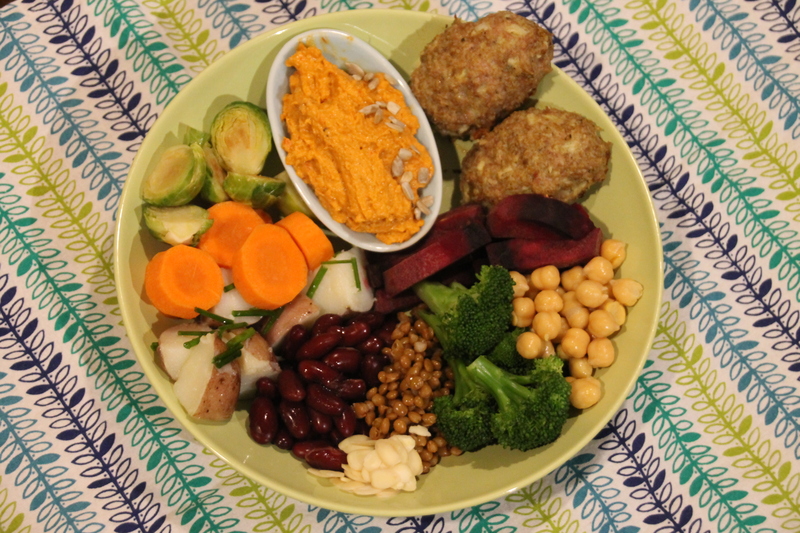 These healthful round bowls of proteins, fresh vegetables and grains are a delight to anyone. In addition, the best part of these bowls is you can use whatever you have on hand and skies the limit. Cook Time: 1 hr. & 30 min. 2. Cut red pepper in half and drizzle with extra virgin olive oil. 3. Roast for 1 hour and set aside to cool. 4. Pour chickpeas, garlic, tahini, extra virgin olive oil, salt & pepper in a food processor and blend. 5. Add in the red peppers and blend once again. 6. Once mixture is smooth, set aside in a small bowl. 2. In a large bowl add in ground chicken and turkey, white onion, garlic, breadcrumbs, eggs and spices and mix until combined. 3. Form ground meat into a football shape and place of a aluminum foil lined roasting pan. 4. Bake for 35 minutes and let cool. 1. Drain and pour kidney beans into a bowl and prepare the lentils by boiling for 5 minutes. Or use canned lentils if desired. 2. Chop chives and set aside. 3. Steam carrots and broccoli, meanwhile sauté brussel sprouts in a frying pan in vegan butter. 4. In a small saucepan boil 2 red skinned potatoes until tender. Let cool and then cut into chunks. 5. Add all ingredients into a bowl and drizzle with lemon oil and serve.